Fantastic snorkeling, dive site. People from all over the world come here. 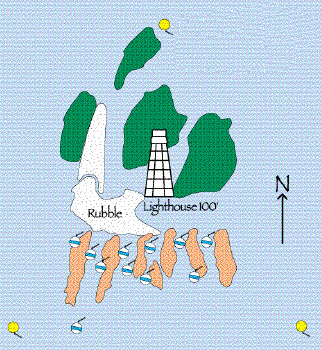 The yellow balls mark the boundaries of the Marine Sanctuary. The blue and white balls mark the mooring balls available to tie up to and enjoy the beautiful waters and its abundance of marine life. Fantastic! It is not recommended you go out (five miles from Marathon) to the Lighthouse if there is much wave action. One or two feet not too bad, but anything over two feet the waters get very rough as they bounce off the reef. Easy to get seasick aboard with the boat being tossed around while moored. Go on a beautiful day that has had no wave action two days before it... the waters will be crystal clear and you'll have the time of your life. 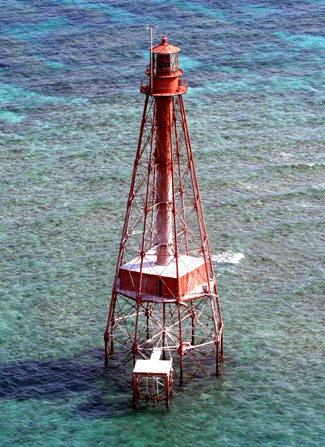 Sombrero Key Lighthouse and its history is documented at the link preceding this info. The link takes you to Lighthouse Friends' website. Wonderful historical information there on Sombrero Key Lighthouse. You can't stop reading it. Thanks to those wonderful people who maintain such an interesting website for all to learn more about the lighthouses in the U.S.